A world split then merged, where four heros rose over time to shape and save the world. This mod, will be my effort to bring as many elements from ToS to Minecraft as possible. Mainly from a first person prospective. I would like to see this mod develop more towards RPG items, that other mods can use, as well as be able to stand by itself and still be a fun mod. This mod will be developed to best be used in combination with Noppes Custom NPCs. Instead of focusing on everything, I'm going to focus on new items and crafting. This mod has been completely resurrected. No work has been done, but I will begin on finding a mod maker and fleshing out the ores and chunk spawning. 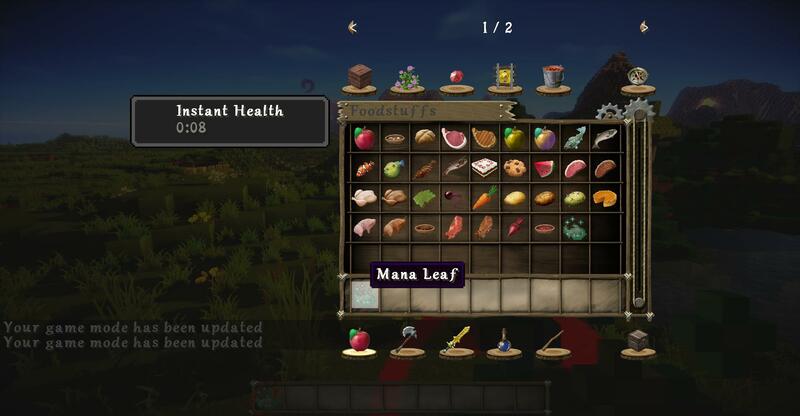 The Mana leaf plant may be completed first. May very well make x16 x32 x64 x128 versions of the mod, as 16x makes my eyes bleed. An exsphere, for those that don't know, is described as a power-enhancer that brings out your best combat abilities. As such the Exsphere will be fairly thought out. I don't want a simple "one item" mod after all, I want a level of depth that matches the game. Exspheres will be (if I can make it) equipped in the accessory slot I will make. Wearing an Exsphere will boost your combat power by 25%. They will be found, unpowered, in rare ore veins. Exspheres are currently brain farting me on how to go about creating them in game. For those that have played ToS and know how they are created, please feel free to pm me with ideas on it. Once wielded, an exsphere can never be removed. If you remove an exsphere, your will start taking damage on par with being on fire. Upon death, a "mutant" will spawn where you died. This mutant is supposed to be you, as in the game, removal of an exsphere causes the bodies mana to go nuts, destroying it. I'm still working on what will happen on removal, but it will be bad. There are other penalties to wearing an exsphere, if possible, after 5 minecraft days you will be treated like you are poisoned. A keycrest must be worn around an exsphere to keep it in check. An exsphere with a keycrest can be removed without problem, as well as protect you from any negative effects a bare exsphere has. This juggernaut is essentially a fully evolved exsphere. Developed by Cruxis, and used among it's ranks. Wielders of a Cruxis Crystal will (if possible) gain the following effects. After 5 MC Days: Players gain wings, allowing them to fly. After 10 MC Days: Players nolonger have to eat. 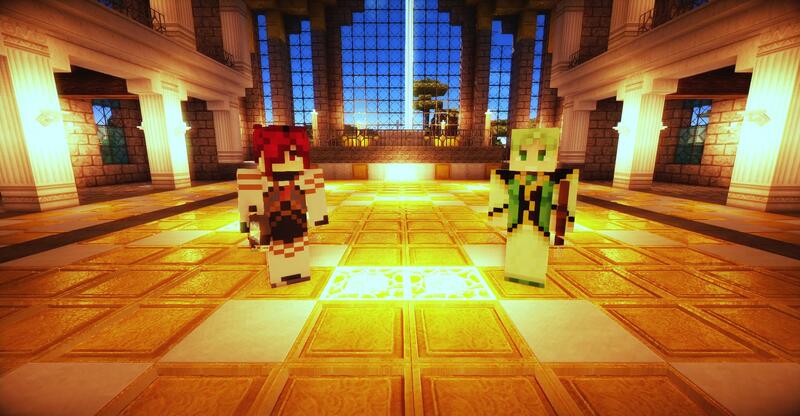 After 15 MC Days: Hostile Mobs glow, and the player can see them easier. After 20 MC Days: Players nolonger feel pain, and become immune to fall damage. After 25 Days: Skin starts to harden, defence increases 25% but players move slower. The Cruxis Crystal cannot be removed once equipped, and unlike the exsphere it is unknown if there are any harmful effects of using one. Chronic Angelus Crystallus Inofficium will be in full effect, and the fix is identical to the games. Not much is known about these, debating making a Derris Kharlan dimension that has it there. A fairly hard gem, that is also very brittle. It will have several uses, and I may make a few tools with it. Namely Shovels with more uses than iron, and pickaxes with less uses than gold. Will be used in several secret recipes. An extremely rare item, that I have no idea how to put in game. If I can figure out how to add a single mob, I'll do that. Unicorn horn can currently be used with adverse effects, including blindness and hunger. Prehaps it's to pure in this form? Apple Gel: Slightly fills the hunger bar, same effect as a healing potion. I'm open to suggestions, and DEFINITELY open to help. I'll take any help you're willing to offer, I'm not a Java coder, and I have a feeling this will be a massive headache lol. Want to help? Send a pm with a link to something you've worked on. I'm not picky in the slightest, but seeing something you have done may give me an idea on where you'd help best. This is merely it's textures, NOT the full block. Zircon will posses some luminescence in it's ore form. And I'd like it to make the "gem" parts of it semi-translucent. If you want to help out with the mod, please by all means, PM me and let me know. Posting an application below is fine of course, but if this topic gets busy I may miss it. Being on the team will require registration on Welgaia's official forum. I did debate adding mana and a whole magic class, but it would likely be as a expansion, along with the rheairds. If I add magic as an expansion, I will be forced to make a "race" chart that the player picks from at the beginning of each world. As only Half-Elves and Elves can use magic in the ToS world. I'd have no objection to having it appear in the inventory screen as a popup, but as it's likely a perm boost, I don't want to crowd the gui. A skill system "technically" will be put in place. The Ex gems would likely fill this niche, with each different gem having tiers they level up to. One of the best games to hit the gamecube, and a fairly rare PS2 game. The games story is like fighting Mike Tyson. Just when you think it's hit you with it's best shot, POW, it hits you harder. Does that all the way to the end. That and it's very possible to get owned so hard you feel like rage quitting because you're under leveled for the fight. Holy Martel, a Tales of Symphonia mod! This is almost too good to be true! Thank you thank you, I should be releasing the first expansion pack soon. While the core mod isn't done yet, I figure an expansion will help raise awareness of it. The expansion will be releasing almost all the food items from ToS into minecraft, with new items and such. Should give the people "hungry" for new food items something to enjoy. Indeed. So let's say you want to make gels- What would need in that case? Ah gels! My my, first off I will have to speak to the owner of wizardcraft and any other popular magic mods, and acquire support from them to make my gels heal mana. Or hell maybe I'll just release magic as an expansion . Indignation and Judgement are needed. Gels though... I actually never thought of them, but they ARE a must. My guess is, for apple gels. In gen 1, then will be made for crafting slime with an apple. In final release, I'd like to have a working "gel shop" that works like a brewery stand. Don't argue with an idiot: he'll down you to his level and then beat you with experience. Or he could actually have a knife. Ah, the Scallop gels. Puzzling Tales players since 2005-6 (I think). Do you plan to make apples and slimes slightly more common, then? Ohhh thats an extremely good point I didn't think of. If I make a custom brewing stand just for gels, I may scrap needing slimes at all. As for apples.... prehaps instead of making them more commmon, one apple nets 16 gels. I'll work on it. I need a coder on board before I can plan it out to be more fun. My line of work on all items. Make the idea, make the concept, make it work, make it fun, make it better. I cant wait to see what you do with this!!! That's a good approach, and the apple thing sounds ok. But just a suggestion, maybe you could make the Sorcerer's Ring that could activate things like redstone,like a beacon or something? Maybe even some of the variations? Perhaps in the future there could be some sort of thing that adds the Tales music, like the audio mod. Also, I have an idea on the exsphere thing. I shall PM you. Second, how can I help? Alas, you have my attention. How may I be of service? Ill provide ideas I suppose. Will you add the Centurions from DotNW as well? You could have them implemented as mobs, and hatch from the centurions' cores. Centurions cores should be found in randomly generated dungeons, one of each element per map. This thread deserves more activity D:But just a suggestion, maybe you could make the Sorcerer's Ring that could activate things like redstone,like a beacon or something? Maybe even some of the variations? Keep up the good work! I still cant wait to see what happens with this. Ask and you shall receive (in pm). Hi Person! If you need help making a texture pack for this I've already started one for vesperia so just message me if you want a symphonia texture pack and I'll got to it! These blocks can make our dreams reality... in a virtual environment comprised of nothing but arranged pixels.